A complete grain ration to be fed to foals and yearling horses. INGREDIENTS: Grain Products. Processed Grain ByProducts, Plant Protein Products. Forage Products. Dry Whey. Calcium Carbonate. Salt, Vitamin E Supplement. Monosodium Phosphate. Sodium Bentonite, Choline Chloride. Copper Sulfate, Zinc Oxide, Active Dried Yeast. Manganous Oxide. Niacin Supplement, Ferrous Sulfate, Vitamin D3 Supplement, Mineral Oil, d-Biotin, Sodium Selenite, Vitamin A Acetate in Gelatin, Menadione Dimethylpyrimidlnol Bisulfite, Vitamin B12 Supplement, Riboflavin Supplement, d-Calcium Pantothenate, Thiamine Mononitrate, Ethyienediamine Dihydricdide, L-Lysine, Natural and Artificial Flavors, Folic Acid, DL-Methionine, Pyridoxine Hydrochloride, Cobalt Carbonate. 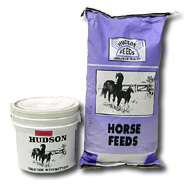 Feeding Directions: Use as a complete grain ration for foals and yearling horses in combination with pasture and or hay. Feed free choice to 8 months of age. Feed up to 5 pounds per head per day to foals from 8 to 12 months of age.